Like many moms, since becoming pregnant, I have looked for natural alternatives to many beauty products. And I have scars and stretch marks post pregnancy that I am trying to get rid of. 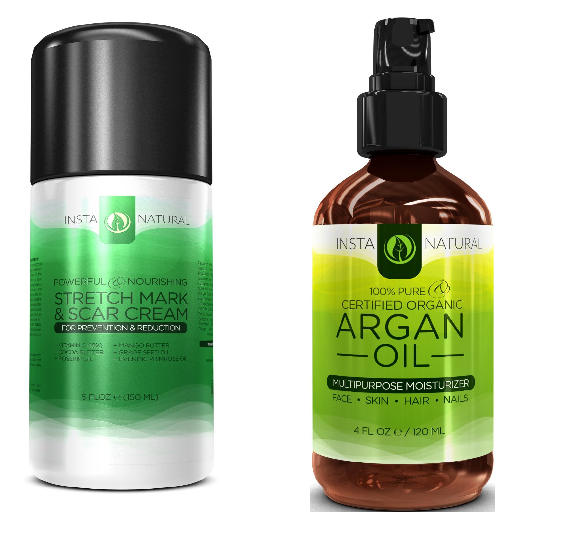 Luckily for me, Instanatural sent me the following products to try. Stretch Mark Cream : I love how easily this stretch mark cream glides on, how quickly it dries and that it really works. Also, the pump mechanism on the dispenser a great delivery method because it dispenses the same amount of product, thus reducing waste. The product is pleasant smelling, only needs to be applied twice a day to work and really moisturizes skin. I like also that the product uses natural ingredients. I have tried other stretch mark creams, since, you know, I have stretch marks from pregnancy, and it is much more pleasant to use than the other creams which makes me more likely to apply it which makes it more effective in treating the stretch marks. Argan Oil For Hair, Face, Skin & Nails : I am a huge fan of argan oil as a moisturizer and this product is a great value. Many other argan oils I have used are much more expensive for less oil. This product is organic and works just as well as the others. The dispenser is really good at controlling output and reducing waste. And the quantity makes it the perfect size to use on my body and hair, whereas in smaller bottles I never felt there was enough to use on more than my face.